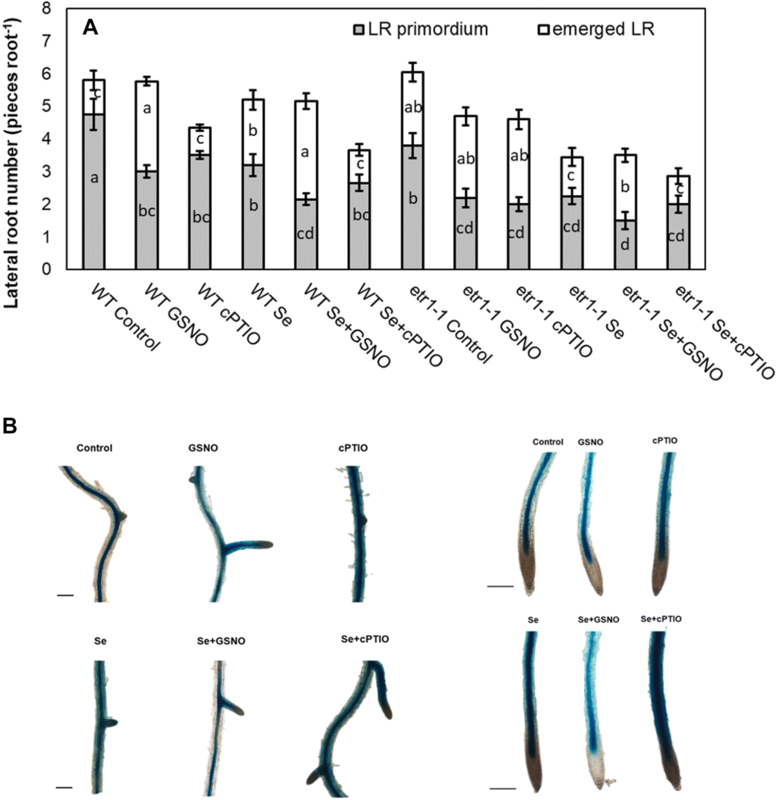 Selenium (Se) results in primary root shortening and the concomitant induction of lateral roots (LRs) (stress-induced morphogenic response, SIMR). Both ethylene (ET) and nitric oxide (NO) are gasotransmitters interacting with each other during plant growth regulation; however, their involvement and interplay in LR growth have not been examined so far. This study investigates the effect of Se on ET and NO levels and interaction in wild-type (WT) and ET insensitive etr1-1 Arabidopsis. In WT, Se at 15 µM concentration triggered LR emergence (LRem) and slight ET level elevation but in etr1-1 Se-induced LR inhibition was accompanied by four-fold ET level increase which can be associated with the increased expression of ACS2 and ACS8. 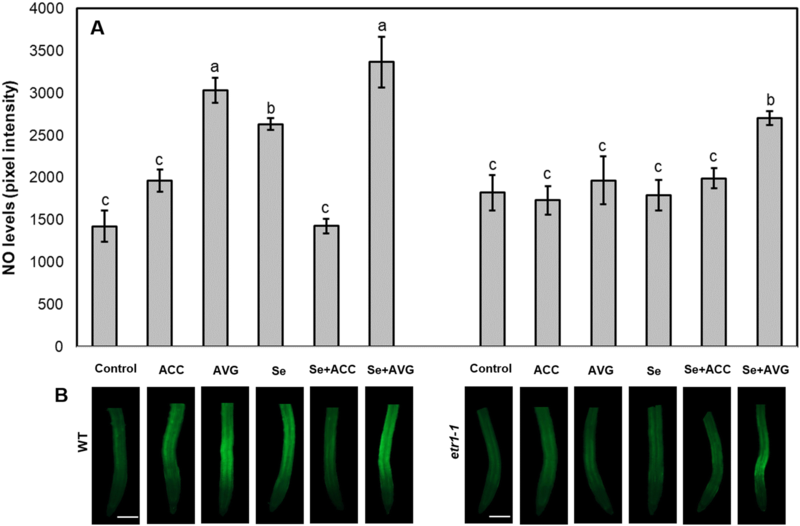 Treatment with ACC + Se decreased LRem and NO level in WT, whereas AVG + Se in the etr1-1 plants resulted in enhanced LRem and increased NO level indicating that ET may inhibit both NO formation and LR emergence in Se-stressed Arabidopsis. The expression of NO-associated genes (NR1, NR2, GSNOR1, GLB1, GLB2), however, did not correlate with NO levels. Application of GSNO together with Se resulted in enhanced LR outgrowth both in WT and in etr1-1, whereas this effect could be reversed by a NO scavenger which indicates the positive regulatory role of NO during LR emergence. Moreover, GSNO has a clear inhibitory and cPTIO has an inducing effect on ET levels. These data indicate for the first time that the antagonistic interplay between ET and NO regulates the emergence of lateral roots in Arabidopsis under Se stress. The online version of this article ( https://doi.org/10.1007/s00344-019-09950-9) contains supplementary material, which is available to authorized users. Selenium (Se) is a naturally occurring non-metal element which is taken up by plants as selenate or selenite (Sors et al. 2005). Due to the chemical similarities with sulphur (S), land plants metabolize Se via S assimilation pathways (Sors et al. 2005). Excess Se negatively impacts plants and causes general symptoms including chlorosis, withering, and stunted shoot and root growth. There are several known reasons for Se phytotoxicity like malformation of selenoproteins, impaired primary metabolism, oxidative and nitrosative stress and hormonal imbalance (Kolbert et al. 2016). At certain concentrations, Se was shown to induce a mixed growth response (stress-induced morphogenic response, SIMR, Potters et al. 2007) during which the primary root (PR) elongation is inhibited and the lateral root (LR) growth is induced (Kolbert 2016). 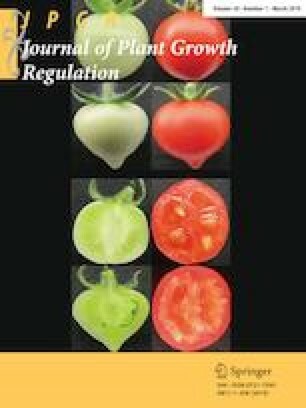 Of plant hormones, auxin, cytokinins, ethylene (ET) and jasmonic acid (JA) have been related to Se stress in previous studies (Van Hoewyk et al. 2008; Tamaoki et al. 2008; Lehotai et al. 2012, 2016). Transcriptomic analyses revealed that Se upregulates ET- and JA-associated genes in Arabidopsis and mutants defective in ET or JA signaling exhibited Se sensitivity relative to the wild-type (Van Hoewyk et al. 2008). In our previous work, we determined that Se increases ET levels and we assumed that ET might positively regulate Se tolerance (Lehotai et al. 2012). These suggest a relevant role for especially ET in Se tolerance. In addition to its stress hormone role, ET also regulates the initiation of laterals in the pericycle as well as LR outgrowth and elongation (Ivanchenko et al. 2008; Negi et al. 2008). Depending on the plant species, growth conditions and concentrations, Se is able to increase or decrease the level of another gasotransmitter, nitric oxide (NO) (Lehotai et al. 2012, 2016; Chen et al. 2014; Molnár et al. 2018a, b; Kolbert et al. 2018). At low concentration, NO is believed to act as a signal regulating stress responses or growth often being associated with hormonal signalling pathways. There are several reports indicating NO-ET interplay during diverse growth responses and the nature of their interaction proved to be mutually negative (reviewed by Freschi 2013). However, we have no knowledge about ET and NO being involved in Se-influenced LR development and their possible interaction is also unclear. Therefore, we aimed to examine the supposed contribution and the putative interplay of ET and NO to the regulation of Se-modified LR growth in Arabidopsis. Seven-day-old wild-type (Col-0, WT), etr1-1 mutant (AT1G66340, NASC ID: N237; Chang et al. 1993) and ACS8::GUS/GFP (NASC ID: N31385; Tsuchisaka and Theologis 2004) Arabidopsis thaliana L. seedlings were used. The seeds were surface sterilized with 70% (v/v) ethanol and 5% (v/v) sodium hypochlorite and transferred to half-strength Murashige and Skoog medium (1% (w/v) sucrose and 0.8% (w/v) agar) supplemented with 0 (control), 5, 10, 15 or 20 µM sodium selenite (Na2SeO3). For root morphology observations and staining methods, 25–30 plants per plate, for PCR method approx. 60 plants per plate, while for ET quantification 120 plants per plate were cultivated. The Petri dishes were kept vertically in a greenhouse at a photo flux density of 150 µmol m−2 s−1 (12/12 day/night period) at a relative humidity of 55–60% and 25 ± 2 °C for 7 days. Endogenous ET levels were increased by the addition of 1-aminocyclopropanecarboxylic acid (ACC, 5 nM) and ET synthesis was inhibited by aminoethoxyvinyl glycine (AVG, 1.5 µM). As a NO donor, 250 µM S-nitrosoglutathione (GSNO) and as a NO scavenger 800 µM 2-(4-carboxyphenyl)-4,4,5,5-tetramethylimidazoline-1-oxyl-3-oxide (cPTIO) were used. Stock solutions of ACC or AVG (in water) were added through sterile filters to the medium cooled to 50 °C (7-day-long treatments). Stock solutions of GSNO or cPTIO (in DMSO) were added on the surface of the media containing the root system of 4-day-old seedlings through sterile filters (3-day-long treatments). The effective concentrations were chosen in pilot experiments and water or DMSO was added to the medium as controls. Chemicals were purchased from Sigma–Aldrich (Merck, St. Louis, MO, USA). Lateral roots within the primary root (smaller than stage VII) were considered as lateral root primordia (LRprim), whereas visible laterals which have already grown outside the PR were considered as emerged LRs (LRem, larger than stage VII, Fig S1, Malamy and Benfey 1997). In each experiment, the root systems of at least 20 plants were observed under a Zeiss Axiovert 200M microscope (Carl Zeiss Inc., Jena, Germany). Arabidopsis seedlings (500 mg, 350–360 seedlings) were incubated in 0.5 ml distilled water for 60 min in gas-tight flasks fitted with a rubber serum stopper under darkness. A sample (2.5 ml) of the gas was removed from the flasks with a gas-tight syringe and injected to a Hewlett–Packard 5890 Series II gas chromatograph equipped with a flame ionization detector (Poór et al. 2015). Five parallel samples per experiment were measured and the experiment was repeated twice. In the GUS-tagged Arabidopsis line (ACS8::GUS/GFP), β-glucuronidase activity was visualized according to Zhong et al. (2014). In each experiment, at least 10 seedlings were stained and representative images were selected. Nitric oxide levels in Arabidopsis root tips were analysed by 4-amino-5-methylamino-2′,7′-difluorofluorescein diacetate (DAF-FM DA) according to Feigl et al. (2013). In each experiment, at least 10 seedlings were stained and representative images were selected. The expression rate of NO- and ET-associated genes in Arabidopsis thaliana was determined by quantitative real-time reverse transcription-PCR (RT-qPCR). RNA was purified from 90 mg plant material by using a NucleoSpin RNA Plant mini spin kit (Macherey–Nagel) according to the manufacturer’s instruction. An additional DNase digestion was applied (Thermo Scientific), and cDNA was synthetized using RevertAid reverse transcriptase (Thermo Scientific). Primers were designed for the selected coding sequences using the Primer3 software; the primers used for RT-qPCR are listed in Table S2. The expression rate of the selected genes was monitored by quantitative real-time PCR (qRT-PCR, Jena Instruments) using SYBR Green PCR Master Mix (Thermo Scientific) as described by Gallé et al. (2009). Data analysis was performed using qPCRsoft3.2 software (Jena instruments). Data were normalized to the transcript levels of the control samples; actin2 (At3g18780) and GAPDH2 (At1g13440) were used as internal controls (Papdi et al. 2008). Each reaction was carried out in two replicates using cDNA synthesized from independently extracted RNAs and the experiments were repeated two times. All experiments were carried out at least two times. Results are expressed as mean ± SE. Multiple comparison analyses were performed with SigmaStat 12 software using analysis of variance (ANOVA, P < 0.05) and Duncan’s test. Selenite was applied at different concentrations and the number of lateral root primordia and emerged lateral roots were counted in wild-type Arabidopsis. The data are presented as Fig S2 and Table S1. The 5 µM concentration had no effect on LR numbers, and 10 µM Se significantly increased only the number of emerged LRs which resulted in unmodified total LR number and a decreased LR primordia:emerged LR ratio (LRprim:LRem). The effect of 15 µM Se proved to be interesting as it remarkably reduced LR initiation (40% reduction) while it induced LR outgrowth (125% induction) resulting in decreased total LR number and a lower LRprim:LRem ratio (~ 50% decrease) compared to control. For further examination 15 µM selenite was chosen. In Se-treated plants, the number of visible (emerged) laterals increased, which led to a more branched root system. This was accompanied by shortening of the primary root (data not shown) which can be considered as a symptom of stress-induced morphogenic response. Lateral root emergence is known to be regulated by ET (Negi et al. 2008; Ivanchenko et al. 2008), thus we suspected that ET signalling is involved also in Se-induced LR outgrowth. Therefore, we compared the LR numbers of WT and etr1-1 in case of 15 µM selenite treatment (Fig. 1a). During control circumstances, etr1-1 can be characterized by the higher number of LRs and lower LRprim:LRem ratio compared to the WT (Table S1). The number of LR primordia was WT-like but the emergence was intensified in control etr1-1 (Negi et al. 2008, Fig. 1a). Although Se intensified LR outgrowth of the WT (Fig S2 and Fig. 1a), in etr1-1 the number of emerged LRs were not increased by Se, instead a significant reduction was observed in the number of LRprim, number of LRem, total LR number and LRprim:LRem ratio (Table S1 and Fig. 1a). These results indicate that LR initiation and emergence of ET insensitive etr1-1 are more sensitive to Se compared to the wild-type. Furthermore, Se was not able to accelerate LR emergence in the absence of ET resistant (ETR) signalling, which reflects to the involvement of ETR-dependent ET signalling in Se-induced LR outgrowth. Despite the differences in their control root system (Fig. 1a), the ET levels were similar in the wild-type and in etr1-1 (Fig. 1b). Selenium exerted different degrees of effect on ET levels in the plant lines, since Se caused a two-fold elevation in ET levels (measured in whole seedlings, Fig. 1b and detected in ACS8::GUS/GFP roots, Fig. 1c) in the WT. Although, in etr1-1 seedlings, Se resulted in a significant, four-fold ET level increase (Fig. 1b). Based on these, it was supposed that the high Se-induced ET levels may be responsible for the inhibition of LR outgrowth in etr1-1. The effects of ACC and AVG treatments on ET levels were determined by GUS staining in differentially developed LRs and PR tips of ACS8::GUS/GFP (Fig. 1c). The ACC treatment increased the ACS8::GUS signal, whereas in AVG-treated roots, the activity of ACS8::GUS decreased (Fig. 1c) indicating that the applied concentrations of ACC and AVG could effectively modulate ET levels in Arabidopsis roots. As shown in Fig. 1d, ACC applied together with Se inhibited LR outgrowth in WT plants, which suggests that increased ET (ACC) has a negative impact on Se-induced LR outgrowth (Fig. 1d). Moreover, the reduction of high ET levels of Se-stressed etr1-1 led to the induction of LR outgrowth (Fig. 1e) which clearly indicates the inhibitory effect of ET in LR emergence as the effect of Se. Regarding the mechanism of ET action, an interplay between ET and auxin can possibly lead to decreased LR emergence in the presence of Se. In response to Se-increased ET levels, auxin transport may be enhanced through the root which limits the auxin that remains in the root locally to stimulate lateral root outgrowth (Negi et al. 2008). We further investigated the Se-induced alterations in the expression of selected ET synthesis and signalling genes (ACS2, ACS6, ACS8, ACO4, ERS1, ERS2, CTR1, Fig. 2). All the examined ACS genes are expressed in the roots (Dugardeyn et al. 2008). Without Se application, 1-aminocyclopropane-1-carboxylic acid (ACC) synthase (ACS2 and ACS8) genes were upregulated in etr1-1 compared to the WT, whereas ACC oxidase (ACO4) and ethylene response sensor (ERS1 and ERS2) genes were down-regulated. In WT, Se reduced ACS2 and ACS6 expression; however, of the ET signal components only the expression of ERS2 proved to be Se responsive. In etr1-1, Se highly upregulated ACS2 and ACS8 genes and the expressions of ET signalling genes were not influenced by Se. Similarly, the expression of ACS2 was induced by cadmium and proved to have a key role in ET synthesis in Arabidopsis (Schellingen et al. 2014). The results show that Se differentially regulates ACS gene expression in the WT and in etr1-1, which may contribute to the observed differences in ET levels evolved by Se (Fig. 1b). At the same time, in control etr1-1 plants, ACS2 and ACS8 genes were highly expressed similarly to the results of Peng et al. (2005). The level of ET in unstressed etr1-1, however, was WT-like (Fig. 1b) suggesting that mechanisms other than the expression of ET biosynthetic genes control endogenous ET levels in etr1-1 (e.g. posttranslational modifications of ACS activities, Wang et al. 2002). Nitric oxide is known to be involved in LR development and interacts with ET in several processes of plant growth. As shown in Fig. 3, Se treatment resulted in 1.8-fold NO levels in WT roots (Fig. 3a), and the increment of NO-dependent DAF-FM fluorescence was restricted to the transition zone of the primary root (Fig. 3b). In contrast, ET insensitive etr1-1 roots showed no Se-induced NO level increase which implies the possibility that functional ETR signalling is needed for Se-induced NO formation. 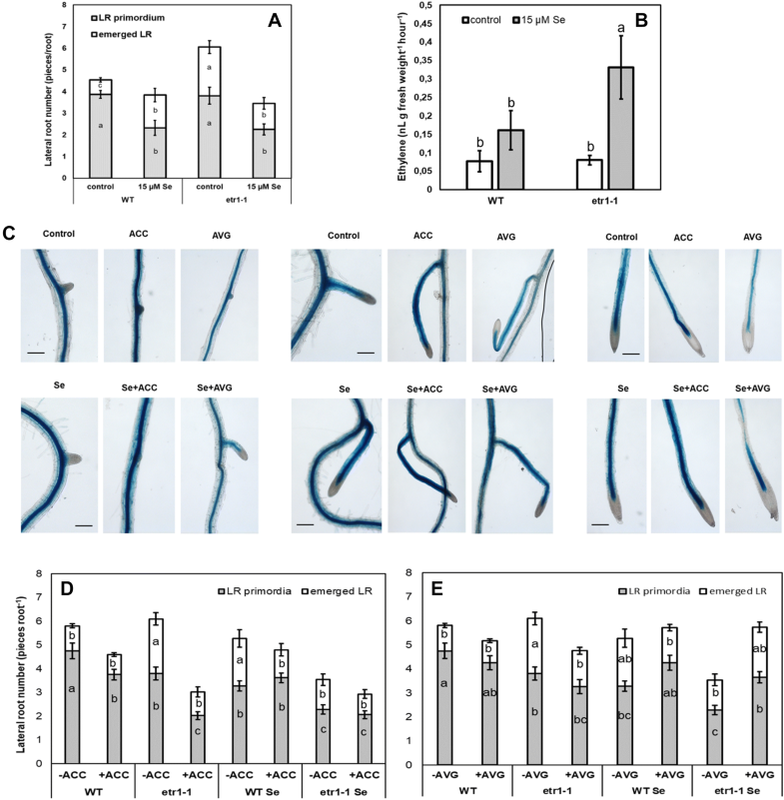 The expressions of the examined NO-associated genes nitrate reductase 1 and 2 (NR1, NR2), S-nitrosoglutathione reductase (GSNOR), nitrogen regulatory protein P-II homolog (GLB1), non-symbiotic hemoglobin 2 (GLB2) were not modified by Se in the WT and in etr1-1 only GLB2 was upregulated by Se (Fig S3). These results indicate that in Se-exposed Arabidopsis, the NO levels may not be regulated by the expression of the examined genes. Based on the lack of Se-triggered NO increase in etr1-1, we can suppose that NO levels can be controlled by ET levels in Se-stressed plants. The application of the ET biosynthetic inhibitor AVG resulted in the remarkable induction of NO levels with or without Se (Fig. 3). Similarly, an increased NO level was detected in etr1-1 treated with Se + AVG compared to plants treated with Se alone (Fig. 3). The NO generating effect of ET inhibition suggests that elevated ET levels may prevent NO level increase in the root system of Se-exposed etr1-1. The mechanism by which ET negatively influences NO production remains to be elucidated. The modification of endogenous NO levels in control and Se-stressed plants could answer the question of whether NO influences ET levels or not and can also clarify the role of NO in Se-induced LR outgrowth. Treatments with the NO donor GSNO resulted in intense LR emergence in control WT plants and a slighter inducing effect in Se-stressed plants (Fig. 4a). These effects could be reversed by the NO scavenger cPTIO but the rate of the effect was not statistically significant in every case. The root system of control etr1-1 proved to be NO insensitive, because neither GSNO nor cPTIO had a significant effect on LR emergence, but in the presence of Se, GSNO was able to notably increase LRem number and cPTIO had a slight inhibitory effect (Fig. 4a). Collectively, these data mean that the enhancement of endogenous NO levels in Se-treated WT and etr1-1 results in enhanced LR outgrowth which reflects the positive regulatory role of NO during Se-induced LR emergence. In addition to cPTIO inhibiting LR outgrowth it had a clear positive effect on ACS::GUS/GFP activity within the root system, whereas GSNO remarkably reduced the ET signal both in the PR and in the LRs (Fig. 4b) in accordance with previous studies reporting and explaining the suppressive effect of NO on ET synthesis (Eum et al. 2009; Cheng et al. 2009; Lindermayr et al. 2006; Abat and Deswal 2009; Tierney et al. 2005). These results collectively indicate that in the Se-stressed root system, increased ET levels inhibit NO generation and NO negatively influences ET levels. It was shown for the first time that the antagonistic interplay between the two gasotransmitters in turn regulates the emergence of lateral roots in Arabidopsis under Se stress. This work was supported by the János Bolyai Research Scholarship of the Hungarian Academy of Sciences (Grant no. BO/00751/16/8) by the National Research, Development and Innovation Fund (Grant no. NKFI-6, K120383 and PD120962) and by the EU-funded Hungarian grant EFOP-3.6.116-2016-00008. Zs. K. was supported by UNKP-18-4 New National Excellence Program of the Ministry of Human Capacities. We thank É. Kapásné Török for excellent technical assistance. ZSK conceived and designed research. GF, EH, ÁM, DO and PP performed experiments. ZSK wrote the paper.